At many times I pinch myself in gratitude as I “feel” God’s presence in my life. Thanksgiving is one of those times. It gave me pause for the many in the world who do great works, show great love, yet have little or no recognition of God in their lives. We all have those who we want to be closer to God, perhaps nevermore so than those in our families. 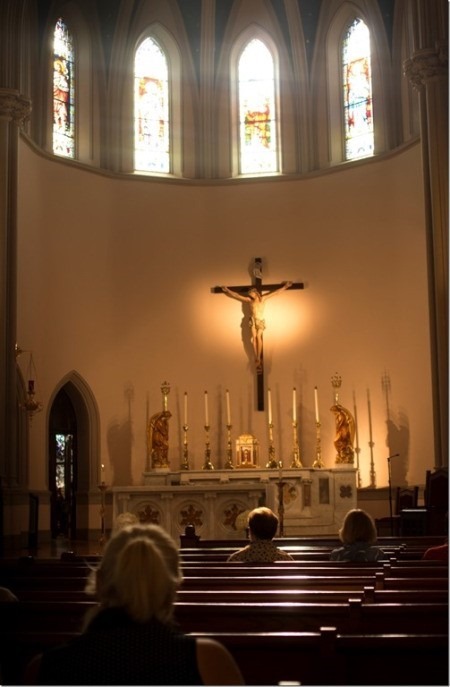 We “want” them to come to Mass, pray and generally recognize God in the same way we do. Yet we might be missing an important point. For those wonderful people we know, who love their family dearly, help others, do good deeds and yet seem to be “non-believers.” Because we cannot imagine living in a world bereft of God, we feel sorry for them, as if God is not present in their lives. Yet we know this to be untrue. God is present in all lives and is manifest through natural virtues as well as the theological ones from our faith. Anyone who loves is loved, gives love knows God; or at least encounters God through this grace. The natural virtues (look them up if you are not familiar with them) are also a gift from God, as are all things which emanate from His love. For myself, meeting these people daily in everyday lives I continue to be amazed at how God operates through others even without their knowledge. How many people in your life display the virtue of love, yet don’t worship in the traditional sense as we know it. While of course, our goal as Christians is to bring others to Christ, to save souls, we also must recognize the Holy Spirit is hard at work in all the others we pray for, work with, give to, and share with. Again, we can be grateful for our own faith, one of the theological virtues, but we also should recognize God’s love in others, and acknowledge they may not be as far from God as we might have thought.